I liked this image…tack sharp! Excellent depth..lovely colors! I am curious to know how you took care of your camera batteries at such an abnormally low temperature! Any special technique to keep the batteries charged up? Picture taken from the third step? Well! It means you started from the North side (Tibet), right!? Thanks for sharing beautiful images! @Abhijit Dharmadhikari, Thank you Abhijit! Much appreciated. Maybe I will write a separate post about photographing at altitude and in the cold, but the basic answer is: keep the batteries inside (warm), use Lithium batteries where possible and don’t use any screen, image stabilizer etc unless necessary. I have been to the base camp twice but never any higher. So this gave me a perspective I always wanted to see – Amazing picture. pretty nice perspective. can’t imagine that you that higher than these mountains. Of all the mountain pictures I have ever seen, this (and its twin) is the most beautiful. Some luck with the cloud layer appearing like an ocean around the peaks no doubt. But the composition with Kangchenjunga in the distance and the clearity and lighting is amazing. You have other amazing photos from Everest and elsewhere, but this is one is a masterpiece. Thank you very much for your kind words Trond, much appreciated. I feel lucky to have had the opportunity to see and share this. Your photo is truly amazing and spectacular. I stared at the photo for awhile. I just love it so much. Have you climbed to Makalu? Thanks Mike! I climbed Everest, ‘next door’, but not Makalu, which would be a great climb as well! Wow !!!!!!! Amazing landscape ! 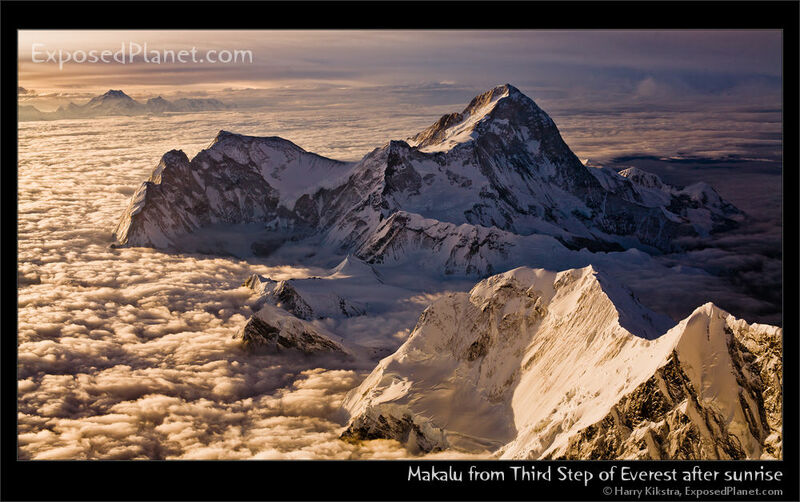 The story behind "Makalu from Mount Everest after sunrise"
One of my most popular images on ExposedPlanet is the image of Makalu at sunrise, taken from the 3rd step of Everest. Makalu is the 5th highest mountain on earth, so there are not too many places from where you can look down on it. I had taken a second image, a while later and had never edited it well, so now is the first time I am sharing this later picture. The original was shot just before the sun came up, this one just after. The light is different, the image is sharper and features of Mt Makalu are clearer. Though the other image is dreamier, I might even like this twin image better, how about you?